Editor’s note: This is the fourth story in an ongoing Long Beach Post series called Safe Streets, looking at the challenges of getting around in the city’s neighborhoods. The tradition seems as outdated as “Leave It to Beaver” these days when students walk, skateboard, ride a bike, are driven by a parent or take a regular city bus to school. For decades, though, the morning ritual was the same in every American city of any size: Students grudgingly woke up and got dressed, bolted down their breakfast, stuffed their homework into their backpacks or bookbags and ran down to the corner to catch the yellow bus to school. And, yes, invariably, the school bus was yellow. At least since 1939, when delegates to the first National Minimum Standards Conference decided that all school buses should be the same color, and that that color should be a hue that could cut through fog, rain and snow. Day-Glo highlighter colors weren’t the rage back then, so the gaudiest color the delegates could agree upon was yellow. As one visionary scientist claimed, “Lateral peripheral vision for detecting yellows is 1.24 times greater than for red.” So, red was out and National School Bus Chrome Yellow was in. Its use was advisory for the first few decades, but it became an official “suggestion” by the federal government in 1974. School buses of any color now are as rare as white rhinos. A handful are still in operation for some private schools, they’re still on the road on Catalina, and the Long Beach Unified School District continues to use a small fleet for transporting special education students. But, starting last year, no yellow school buses have run a regular route in Long Beach and that number isn’t going up this year. School busing peaked in the Long Beach Unified School District in the late part of the last century for a variety of reasons. The fact that baby boomers were in their schooling years was a main cause for the busing boom. 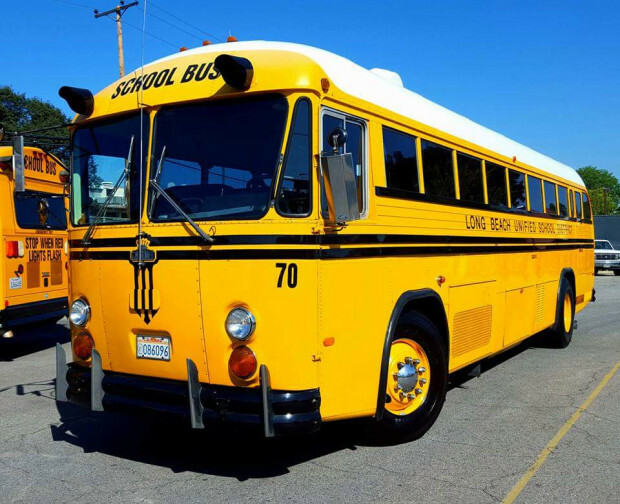 “Through those years in the mid-1970s, on into the early 2000s, we had about 98,000 K-12 students,” said Sue Perkins, LBUSD’s interim director of transportation. After LBUSD busing’s biggest year, the school year of 2000-2001, “we transported 20,687 students per day,” she said. “That was our peak year.” But enrollment topped out and began declining in 2002, “Now enrollment is in the low 70,000s,” she said. Also in the 1970s, school desegregation was in full effect in Long Beach. That, combined with overcrowding in central city schools, resulted in the district busing many Latinos and African-American students to the less-impacted schools on the east part of town, while inner-city schools, notably Poly, instituted magnet programs to lure white students to their campuses. Today, the district has an open school-of-choice policy which has further hastened the demise of the school bus, with students in every Long Beach neighborhood selecting any number of schools over the one closest to their homes. Perkins came up as a bus driver for the district, back in when drivers piloted the big Crown motor coaches along some 150 routes in the city. “I had a steady route for six or seven years at Stanford (Middle School) in the early ‘90s,” said Perkins. “I took students from Stanford across Pacific Coast Highway to drop them off in the central part of the city. Those were ‘my kids.’ I drove them, then later I drove their younger siblings. Sometimes they got rowdy and noisy, but mostly they were pretty good. On the day of the King verdicts, “things were a little more than tense,” she said. Today, the bus drivers of Long Beach have all quit or retired. A few people in the district’s transportation department are licensed bus drivers, but the big yellow buses have been relieved of their decades-long duty. Students now get around in other ways: by Long Beach Transit buses, SUV- and minibus-driving parents and whatever else moves them.